Over the past few years an interesting trend has been happening in the United States and Canada. Consumers continue to text each other (called person-to-person, or P2P) using SMS at rates not seen in other regions, such as Asia-Pacific and Europe, for several years. There is also substantial usage of WhatsApp, WeChat, Facebook Messenger, and Snapchat in the U.S. and Canada; however, for “normal” P2P conversations, consumers continue to leverage their default messaging apps on their devices. Non-SMS-based messaging apps (e.g., WhatsApp, WeChat, and Facebook Messenger) have not heavily cannibalized U.S. SMS traffic, as in other regions. Users of non-SMS alternatives such as Facebook Messenger and Snapchat continue to use SMS-based options, which are essentially the default browsers for “normal” texting. Over the last 8 or so years, there have been IP-based OTT alternatives that do work with SMS. Companies such as Pinger, TextMe, TextPlus, TextNow, and Google Voice work with Verizon, AT&T, T-Mobile, Sprint, as well as Canadian operators such as Bell Mobility, Rogers and Telus. These offer free-to-use options that have the same reach as traditional mobile operators for messaging. In fact, Pinger, in terms of volume, has been ranked as high as #6 in the United States. Back in the late 2000’s, we coined the term “NUVO” (Network Unaffiliated Virtual Operators) to describe these service providers – similar to an MVNO; however, they do not resell a mobile operator’s network. Years ago, the mobile operators agreed to interwork with these players as if they were another “operator.” Some also provide VoIP services as well as SMS. This interworking was guided by the CTIA Inter-carrier Working Group – a still-active group that is finalizing the newest generation of best practices for Person-to-Person interworking for the United States. The ability for the IP-based SMS-interworking service providers (e.g. NUVOs) to obtain geographic telephone numbers was a key benefit. In the U.S. and Canada, there is no difference between texting a geographic number or a mobile number. Mobile telephone numbers have no distinction in North America, unlike many other countries. The ability to acquire inexpensive phone numbers gave rise to companies such as Twilio, which help businesses of all kinds easily leverage the SMS (and voice) channel to engage their consumers – both for P2P and A2P. The U.S. market has also continued to evolve. Now U.S. subscribers pay very little for SMS – often with “unlimited texting” bundles as part of a data plan purchase, or greatly reduced prices for unlimited SMS. When iOS is strong, we see a more pronounced decline as there is more iMessage-to-iMessage traffic (not using SMS). In contrast, when Android has a higher market share, SMS-based texting prevails. This accounts for the actual 2015 rise in SMS volumes. As of September 2016, comScore indicated that Android had a 54.7% market share vs. 42.8% for iOS, with iOS down 0.5% from June 2016. What has worked and continues to work for the mobile operators? Bundled SMS pricing – either bundled as part of a data plan or very low-cost messaging bundles for post-paid (and even pre-paid) subscribers. U.S. and Canadian operators focus more on providing innovative mobile data plans and lumping in SMS/MMS into those plans. No difference in pricing between SMS and MMS. A message is a message, regardless of whether it contains rich media or not. This is how subscribers see messaging and operators have obliged. Ability of SMS-interworking OTTs to operate in the country. Provided alternatives to non-SMS OTTs such as WhatsApp, etc. That said, North American subscribers are heavy users of Facebook Messenger, Snapchat, WhatsApp, WeChat (especially popular among Asian-communities), and many others. But somehow, that usage doesn’t displace mobile consumers’ use of their devices default texting apps. 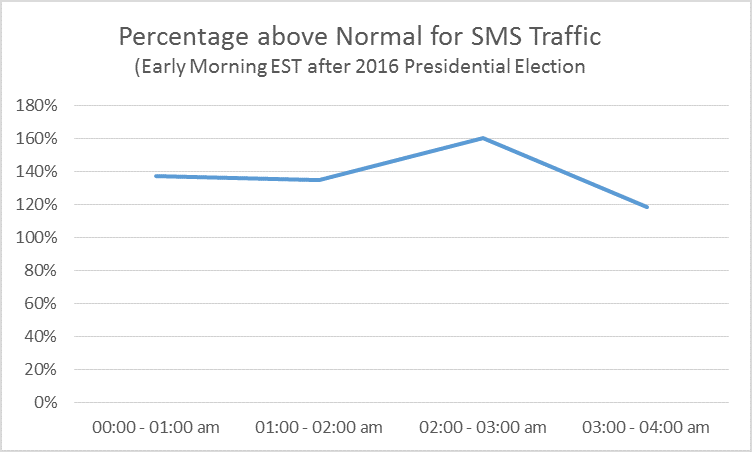 Anecdotal evidence of the continuous usage of SMS could be seen in the early-morning hours, immediately after the 2016 U.S. presidential election. As it became clear that Donald Trump would defeat Hillary Clinton, U.S. SMS volumes surged over 100% of normal volumes, as subscribers texted and discussed the news. Going forward, we expect P2@ texting to continue its slow decline in this market. However, SMS-based enterprise (or A2P) messaging is expected to surge well into the 2020’s. It is easy and inexpensive, and options for business deployment will increase. There will be other channels, but expect to see SMS-based chatbots; “Call or Text” for customer service (including text-enabled toll-free numbers), more SMS-based 2FA, more SMS-based notifications and marketing campaigns. For more on mobile messaging, see A2P SMS Remains Key To Multichannel Mobile Engagement.